There’s Hardly A Ryhme for tobaggen… only one inside my thick noggin…but never you fear…TNSAR gathers near…in a hut known as Granlibakken. For More Literary Hijinks, come to the next TNSAR general meeting, Monday, January 4th, 6:30pm at the above-mentioned hut. No reading club can be this much fun. No pop quizzes, please. Finding Mr. Lucky TNSAR pagers wailed, chirped, and vibrated (my new pager seems to do all the above) on Tuesday, December 15th, for a snowboarder, aka Mr. Lucky, lost out of bounds off the back side of the Alpine Meadows ski area. Though the weather was balmy outside my Kings Beach abode, it was anything but along the crest of the Sierras. 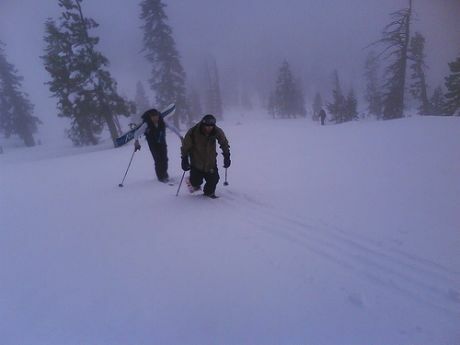 According to Alpine Meadows ski patrol, at around noon when Mr. Lucky exited skier’s right off the Summit Chair, thick fog along the ridge reduced visibility to barely beyond ski tips. And, like so many of our esteemed clientele who have skied before him, instead of continuing down the ridge and dropping in-bounds to the right, Mr. Lucky dropped left out of bounds and found delicious untracked snow. And not a chairlift in sight! It was not long before he was sucked down into the Whiskey Creek drainage on the north flank of Big Springs creek. When his snowboard finally came to a stop, Mr. Lucky quickly realized he was knee deep in heavy wet snow and up to his eyeballs in trouble. It is at this point in the narrative when you should begin wondering, aloud, why I continue to call him Mr. Lucky. And it is precisely at this point in the narrative when I will begin to unfurl the long list of reasons why we searchers settled on the nom be plume of Mr. Lucky. Though there are many other good ones, probably the number one reason why Mr. Lucky ended up being called Mr. Lucky is due to a single fact that was entirely beyond his control; his cell phone registered one slender bar of coverage down there in the Whiskey Creek drainage. Without that little bit of pixilated luck, Mr. Lucky most likely would have ended up very much unlucky and very much dead. Why? Because he was alone…without a beacon, a shovel, a probe, or even a backpack… he was without food, water, or even basic wilderness survival skills…he was entirely lost and completely unfamiliar with the ski area and with the area in general. In fact, he was a brand new Long Island, NY, transplant to Tahoe. He lived alone and had no roommates. It was Tuesday afternoon and he wasn’t supposed to be at work until Friday. There was no one waiting for him to come home, there was no one to report him missing. No one knew he was out there! He did have one thing going for him…a plan. Unfortunately his plan was to start post-holing downstream and follow the creek into La-La Land. Hence the Mr. Lucky nickname. Simply put, without his cell phone Mr. Lucky would have ended up with another nickname entirely. But by means of some electronic New Orleans style technological black magic that entirely eludes me, that one slender bar of cell phone coverage got a message through to the Alpine Meadows ski patrol who sent out a patroller who found and followed Mr. Lucky’s tracks. TNSAR was really only called out to assist the patroller and to make fun of Mr. Lucky’s predicament. That, of course, is entirely untrue. We did assist in bringing Mr. Lucky and the patroller candy bars. Surely without the extra sugar both would have perished. The Take Home Message here is obvious, switch cell phone carriers to the one that Mr. Lucky had. It will likely save your life. My phone coverage was dead as a doornail out there. Paging Chris McConnell…No, No, No! The take home message is to simply be prepared. For what? For the unexpected. How does one prepare for that? Knock-knock Puddin’ Head. All you have to do is attend TNSAR’s 4th grade Winter Wilderness Education Program. Why? Because we teach kids basic winter wilderness survival skills. Good, simple, straightforward skills that could have easily saved Mr. Lucky if he didn’t have that one slender bar of cell phone coverage. Exhibit A: the garbage bag. Exhibit B: the candy bars stuffed into coat pockets. Exhibit C: the three W’s. Exhibit D: STOP. Simple skills that save lives. You will note that carrying a cell phone is not listed as a simple, straightforward, survival skill. Clearly, as Mr. Lucky so elegantly illustrated, cell phones can save your life. But most often cell phones give people a false sense of security that only leaves them helpless and ultimately hopeless. God grant me the serenity to always stuff candy bars and garbage bags into my pockets before I go skiing…or something like that.